Vigils and silence, let troubled thoughts cease. For soon he shall come, as the heavenly groom. And I must decrease, that he may increase. When by God's own word, heaven the earth does kiss. From a fallen race, lovers you did win. Here on this earth, with human feet you trod. Wholly man like us, and yet wholly God! "Puer natus est nobis, et filius datus est nobis!" Today a child is born to us, a son is given us! These words upon the joyful Mass of Christmas day, in which we recall the birth of our Lord into the world, and into our hearts. 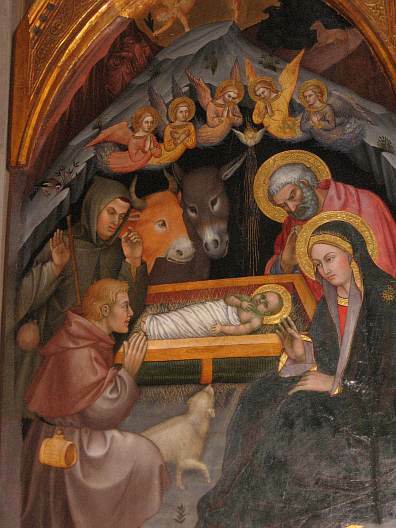 The God who is above all stoops down in humility and love, manifesting his glory in the little child of Bethlehem. Born from the Father from all Eternity, he was born in time in Bethlehem, so that he might be born in our hearts. Pope Benedict XVI's homily for the Midnight Mass and the Urbi and Orbi address.